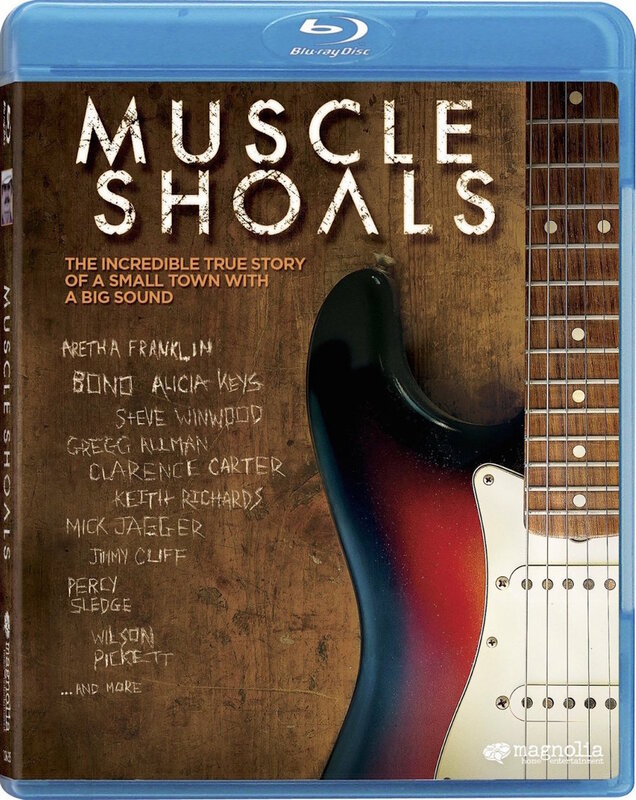 "Muscle Shoals" (2013), Blu-ray. A Magnolia Home Entertainment release from 2013. Video 1080p/24 at 1.78:1 Aspect Ratio. Audio DTS-HD MA 5.1 48 kHz. 1 Hour 51 Minutes. Extras include TWO Commentary tracks. The first is by Director Greg 'Freddie' Camalier. Camalier makes a great documentary, but doesn't seem to have the knack of making a Commentary track. It's pretty bland. The second, on the other hand features the true stars of this documentary, FAME Recording Studio head Rick Hall, two of the "Swampers" rhythm section, Jimmy Johnson and David Hood, and keyboardist song-writer Spooner Oldham, also featured in these recordings. This is one dynamite commentary track, as all four of these guys know how to tell a story, and they all have great stories to tell, both about the events covered in this documentary and the actual process of shooting the documentary. HD Extras include the Theatrical Trailer and 28 minutes of Additional Scenes and Interviews. The Editing of the documentary itself is exceptional, and it certainly makes sense these scenes didn't make the cut, but they are all interesting in their own right. Grammy Awards Nomination for Best Compilation Sound Track for Visual Media. Greg 'Freddie' Camalier's Directorial debut is a documentary featuring extensive interviews from the likes of Aretha Franklin, Mick Jagger, Keith Richards, Bono, Wilson Pickett, Etta James, Steve Winwood, Gregg Allman, Percy Sledge, Alicia Keys, Clarence Carter, and Donna Godchaux. Not to mention archival material from Duane Allman, Otis Redding, the Lynyrd Skynyrd band, and Freeman Brown. The STARS are the backing musicians and recording engineers who created musical magic in the sleepy, backwater village of Muscle Shoals, Alabama -- population 8,000 and surrounded by dirt roads -- starting in the late 50s. As Atlantic Records music mogul Jerry Wexler says at one point, who would ever believe the best from say, Aretha Franklin -- the unchallenged Queen of Soul -- was music made by a bunch of young, white guys who all looked like they worked at the corner grocery store? It all starts with Rick Hall, a sawmiller's son, raised in abject poverty, who started as a musician and song-writer, but switched to being a record producer when an acquaintance came up with the huge sum of $500 to get things rolling. The first single he recorded -- written and sung by a bellhop from the local hotel, and backed by Hall's own band -- became a hit. As did a subsequent record -- Jimmy Hughes', "Steal Away" -- which Hall managed to get pressed and distributed by Atlantic Records. By this point Hall's original band had gone their own ways -- Grand Ole Opry and such -- and Hall had to put together a new rhythm section of backing musicians to work with the singers and songwriters he hoped to attract to his fledgling, FAME Recording Studio. These four: Barry Beckett on keyboard, Roger Hawkins on drums, David Hood on bass, and Jimmy Johnson on guitar -- later to be known as "The Swampers" -- became the core of "the Muscle Shoals sound", with additional key contributions from guitarist Pete Carr, and organist/song-writer Spooner Oldham. Now comes fate into the picture. Jerry Wexler had been getting many of his R&B recordings made at STAX in Memphis, but he had just had a falling out with the owner of STAX. So, thinking of the money he'd just made on that hit, Jimmy Hughes single, Wexler called Hall and said he'd like to bring another artist down to record at Muscle Shoals instead of in Memphis. That was Wilson Pickett, and the result was "Land of 1000 Dances" and "Mustang Sally"! Both smash hits. Wexler couldn't believe it! The recording process at FAME was entirely unlike anything he was used to from, say, New York or Memphis -- where records were made with arrangements and charts for the musicians. At FAME, Hall and his rhythm section worked more like musicians jamming with the artist. The records were created collaboratively -- jamming and improvising until it came together. Meanwhile Wexler had his eye on another singer -- Aretha Franklin -- who was being grossly mismanaged by CBS Records. They had her recording lounge songs! Which of course were going over like a lead balloon. When CBS dropped her contract, Wexler snapped her up and took her to Muscle Shoals. There the jamming -- what Franklin called "head sessions" -- let her reveal her true musical gifts, with the backing musicians improvising along in response. The result was "I Never Loved a Man", and then in sessions later finished in New York, her amazing, "Respect". By this point other recording artists were taking note. There was a recognizable sound in these recordings -- partly from the musicians and partly from the technology. (They were using new mics which let them close-mic the drums for example, which meant you could heat up the bass drum line without screwing up the rest of the mix.) Artists started to recognize the name Muscle Shoals as some mysterious place -- away from the hurly-burly of the "normal" music industry -- which just happened to keep churning out hits! The discography which came out of this period is astounding, as is the repeated amazement when different recording artists finally got to meet the people at Muscle Shoals creating all this stuff. Paul Simon for example, called a producer and said he wanted, "That same buncha black guys," who had played on a particular hit single. The producer told him, "Well, that can be done. But I'll tell you these guys are mighty pale." Keith Richards of the Rolling Stones was so impressed he told Mick Jagger they absolutely HAD TO find an opportunity to record at Muscle Shoals. Their career was already a whirlwind and they only had a few days to spare, but the result was "Wild Horses", "Brown Sugar" and two other songs! Richards says it was the most productive recording session they'd ever done. Camalier's documentary covers the music of course, but he also takes the time to let Hall and his musicians tell their own story, and to let the environment of Muscle Shoals permeate the film. There's some marvelous cinematography here, shot using a RED digital camera by Anthony Arendt (who also holds the credit of "Virtual Camera Operator" for "Avatar"). The scenery shots are particularly impressive -- exceptional composition and eye for color. A shot of leaves just turning color and having fallen into the water is startlingly artistic, as are some particularly good examples of landscapes, sunsets, and architecture. Camalier also takes the time to point out some of the history of Muscle Shoals which reveals it has been creating magic for quite some time. For example, this is where W. C. Handy -- "The Father of the Blues" -- transcribed and popularized Blues music. This is also where Helen Keller was born and raised. Camalier also incorporates archival footage from multiple sources: 8mm films shot at FAME, a 16mm Swedish documentary which actually captures some of the recording sessions, and another documentary on the Rolling Stones which captures their time at the "Muscle Shoals Sound" studio. As I mentioned in the sidebar above, the Editing on this documentary is TERRIFIC, and all of these disparate elements blend exceptionally well with the modern interviews and establishing scenery footage. PQ and AQ on this Magnolia Blu-ray are exceptionally good -- I think it's the best I've seen from this label. Of course the music is given the A treatment. The recording history here includes older Mono and newer Stereo recordings, but you never really notice the age difference. The bass line -- so important for "The Sound" -- has been expertly mixed. The Surrounds are subdued during the music, but light up nicely with ambience in between. This is just a flat out, wonderful documentary. I can imagine most folks will be drawn to it by the music and by the list of major recording stars who are interviewed. But I guarantee you will end up being MOST impressed by Hall, himself, and the musical talent he brought together, in the middle of nowhere, to create musical magic.